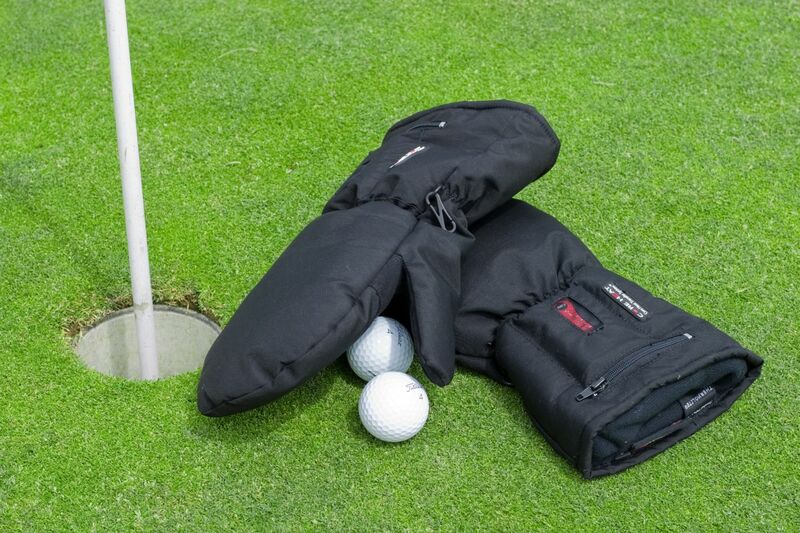 A pair of Core Heat mitts including a lithium-ion battery to keep you warm in your golf cart. --One size fits most, from ladies xsmall to mens 2xlarge. --The mittens come in black only. --The power source is a 7V 2.2 Ah lithium-ion rechargeable battery. The battery is rechargeable 500 times. --Brushed polyester shell with water resistant coating and waterproof inside to keep your hands dry. --Extra cold-resistant insulation for added warmth. --Surface temperature is 135 degrees F at the high setting which will last for 2 hours. The mitt's battery can also be switched to range from 75% to 25% which will allow the heat to last longer at a lower level. Extra batteries are available. --Goat skin palm for grip and durability. --Polyester fleece interior is soft and comfortable. Lifetime warranty on the mitts and 90 days on the lithium batteries. A mitten is warmer than a glove. These mitts provide heat not only to the hand but also down to the fingertips. The mitts are great for golfing in the snow, hunters, and ice fisherman who need to take their mittens off easily and quickly. Take them with you to the outside sports stadium too. The heated mittens are temporarily out of stock.